I don't do New Year's Resolutions to lose weight. This is not because I don't need to lose weight, but because it's a really rubbish time of year for motivation and willpower - in the UK January is the coldest month of the year and my birthday also falls a couple of weeks after Christmas so any strict healthy eating plan would fall over as soon as the birthday cake starts calling to me. We try to strike a balance between eating healthily and being able to enjoy treats as a treat, with the hope that this sets an example for a good relationship with food for the kids. However, for the last couple of years in the run up to Christmas I have cut back my treats and increased my exercise in order to lose around 7lbs so I can go into the season of temptation without feeling bad every time I'm offered a mince pie or a cream drenched lump of Christmas pudding. I can feel my clean eating friends wincing, but experience has shown me the limit of my will power and I'd rather end Christmas the same weight I started November than 7lbs heavier. I'm over 3 stone lighter than I was in 2005 (42lbs) which I'm really pleased with for the benefits to my health and my wardrobe, especially given the 5 stone (70lb) I gained and lost during and after my pregnancies means a total loss during this 10 year period of 8 stone (112lb). I don't want one season of festivity to derail this slow trend towards a healthy weight. This year I have a new assistant in my fight against the flab. 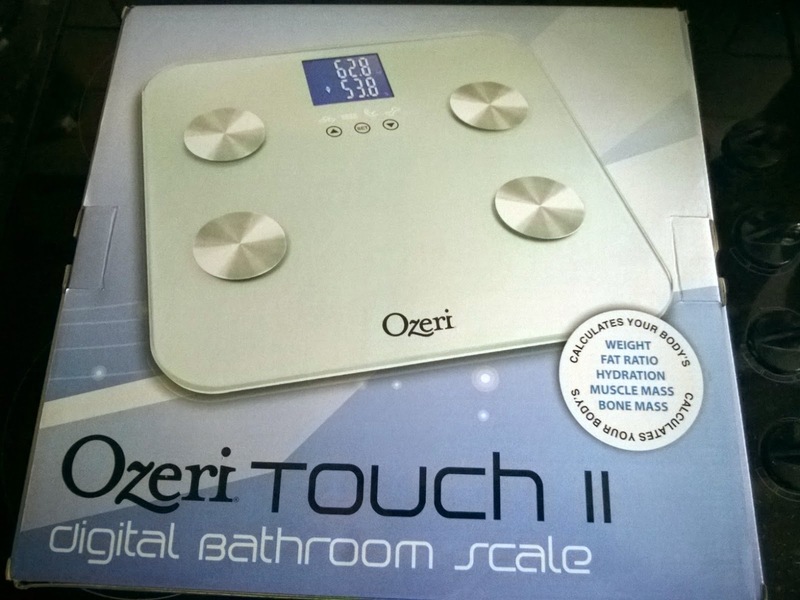 I received the stunning Ozeri Touch II digital bathroom scale last week and have been thoroughly impressed with it. My old bathroom scales were as embarrassing as my waistline and as rusty as my joints, so to receive a good looking new set of scales was a real treat. My old scales also only measured weight, which was useful for tracking changes and working out BMI, but so last century in terms of what we expect of modern bathroom scales. The Ozeri bathroom scales are just as beautifully designed and well made as their other products. Ozeri made their name as a company supplying luxury hotel apartments, relying on the quality of the products to sell themselves to the visitors on these exclusive club holidays. Now they have brought the same quality and design to the general market. According to their website they are the first manufacturer to champion the use of Microban antibacterial coating on bathroom scales, so they will remain hygienic and fresh smelling even if the feet standing on them are not. The new scales are accurate to the scale of ounces (or grams if you prefer) which I tested by weighing myself, then stepping on again holding a 7 ounce bowl which I had previously weighed on my kitchen scales. They also measure the percentage of body fat, water and muscle, plus give an estimate of bone weight. A handy guide booklet is provided to look up what a healthy level of each is considered to be. This was the bit I really liked - although my BMI puts me in the obese band, the measurement of my body fat (37.5% on my first weigh-in) dropped me into the next band of 'overweight' rather than obese. I could see from the scales that I was dehydrated, that I need to increase my muscle mass a little, but that my bone weight is almost double the minimum considered healthy for my weight band. I am genuinely heavy boned (although undeniably also heavy fatted). Curiously, it showed that Matt, who is from a visual inspection just perfect, is actually further below his minimum healthy muscle level than I am, My days of running around after busy little lads who often want a carry home afterwards must be better for the muscle mass than working in an office, although since he is 2 stones lighter than me and has less than half as much body fat by percentage, I don't think he's too worried. 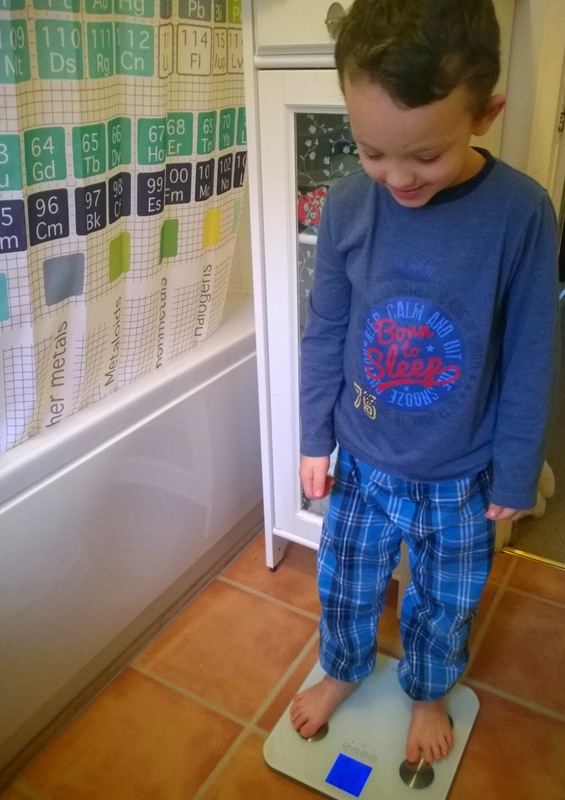 The scales are also useful for weighing the boys every so often for their growth charts. Although this is something I don't worry about it's nice when the numbers confirm the evidence of my eyes that the boys are growing up strong and healthy and following their expected growth curves. For much older children the other measurement functions can also be used. The extra information from these elegant high tempered glass scales is now forming the basis of my plan of action to shift those pre-Christmas pounds. I can see that I need to increase my hydration, so have started drinking an extra 2 pints of water a day, split into 4 servings. I need to increase my muscle mass a little, so will ramp up the weight bearing exercise to include an extra run on the sea front with the kids as soon as I shift the cold I picked up from them. This will also help to maintain my healthy bone density. 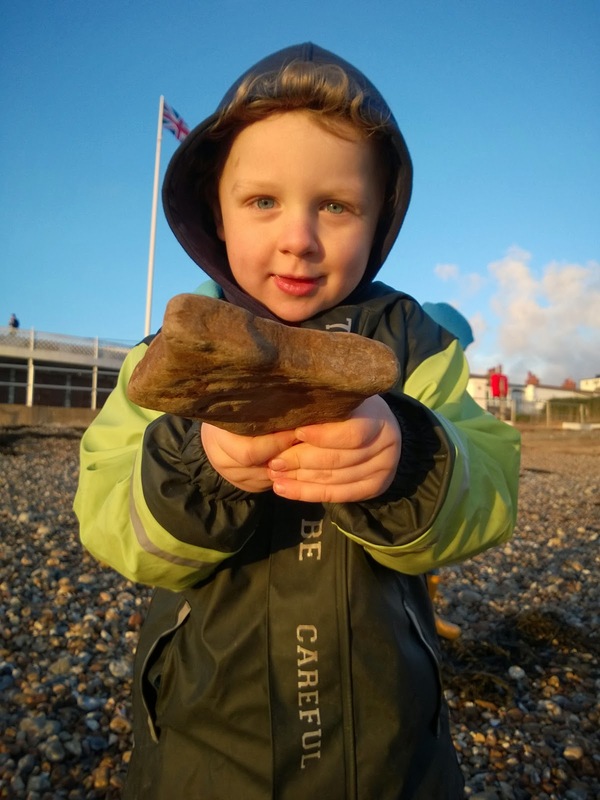 Perhaps I should follow Toby's lead by finding the heaviest stones on the beach to throw in the sea to tone my arms and increase lean muscle there. I will also continue to resist the post-study late-night toast cravings. So far in the week since receiving the scales and implementing just the extra water and toast reduction elements of my plan I have lost 2lb 4oz, and a little over half a percent of my body fat, plus have increased my percentage water by 2%. Interestingly, after just a few days of reduced activity due to my cold I could also see my muscle decreasing - down by 1% in a very rapid space of time, emphasizing the importance of daily exercise. The scales have a feature I have never seen before too - when you set your initial details such as height, age and gender you can also select the option 'male athlete' or 'female athlete' - a great addition as I'm sure folk who are more muscular than the average person get annoyed by having a high BMI when they know that they are heavier but not overweight. For my own health as well as to provide the kids with a good role model who is able to keep up with them as they grow taller and faster I am glad of this extra boost to the healthy plan. I have measured myself every day this week as part of my trial of the product, but from here on in I will be stepping on less regularly and enjoying the weekly treat of seeing muscle go up and fat go down. For all those amazing folk out there who enjoy stronger will power than me and do head into January with good resolutions, this set of scales would be a good present to yourself for Christmas. Note: I received the scales for free in order to review them, but opinions given, embarrassingly high body fat stated and gorgeous cheeky boys are all my own. I just had a look on Amazon and the scales are currently (28/11/14) on sale at 57% off and have free delivery.